It’s a rarity for Ginger and me to get away from the airport. It’s even rarer when we have time to visit friends at their events. Therefore, if enough time comes free, we always try to sneak in a trip to a event hosted by someone else. This November, it was the Veteran’s Day Fly-In at Ron Alexander’s place, Candler Field. There's always something really special about other people’s fly-ins. To us that something is the fact that wherever it is it’s being put on by someone else; a real guilty pleasure of ours. Despite this though, our need to do something always kicks in and before long we find ourselves folding chairs, running errands, and moving planes. The last one is how I came to spend a day with an amazing duo, Bestmann and Robin. There is another side to this experience though, being the volunteer. If you have ever helped an owner reposition his or her mechanical eighty year old baby into a tight hangar, you understand that in this manner one can quickly ascertain the disposition of said owner. Human dispositions may vary widely but when it comes to aircraft owners, there are basically two types; non-pilots and pilots. The first type is the guy who wants the tires to hit the same tracks on the hangar floor, demands the tires sit on carpet squares, and insists on checking everything you do despite the fact you obviously just checked it yourself. Once it is in the hangar, he drapes a cover over any opening, hangs from the airplane a special gadget he made to catch drips, and finishes with a ritual. This ritual, or rain dance as I call it, usually involves the random checking and double checking of random odd items on the aircraft, the wiping of key aircraft surfaces to remove any traces of flight, positioning of aircraft control surfaces to neutral, and a final inspection of that one thing he is worried might break, whatever it is. The next or second type is the pilot. 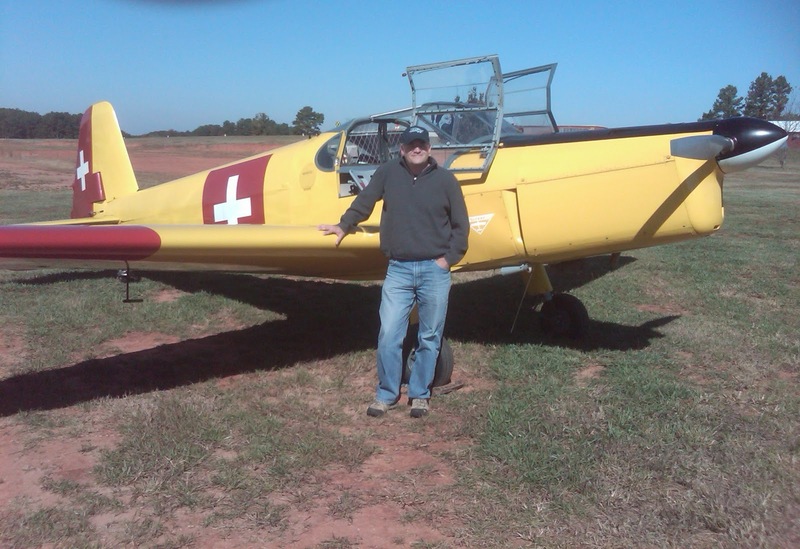 It’s hard for me not to admire a wonderful plane when in its shadow and after a few minutes of doing so, I found myself with a new friend named Richard Epton. Soon thereafter I was given a tour of the plane. Of note in this tour were all the things you would expect; the large diameter high pressure tires, the wide out-rigger landing gear, the long wings, and the way it feels to sit in the pilot seat. I must say, that pilot seat does feels unique. Therefore, when Richard asked what time we were leaving the next day, I instinctively responded, “When should we?" As I pulled up the next morning to collect on Richard's offer to fly, a cold clear blue sky awaited. 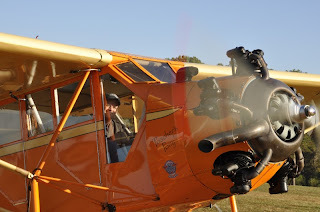 Climbing into the pilot’s seat, I listened carefully to what he had to say. Well, actually I listened as well as I could. Underneath me though, wicker crackled like a saddle announcing the mount a horse and out front metal plinked as it cooled from Richard’s warm up flight. These little details made it difficult to stay focused and yet I somehow managed to gather the Robin does nothing unexpected, you fly it mostly with rudder, and “it flies like a Cub with a thousand pound bomb strapped to its belly.” That last bit is typical of Richard’s sense of humor. Thankfully, this is all you need to know to fly a Robin and just when I was about to shut the door, Richard grabbed it. Sitting there, looking out at Richard with him looking in at me, the air took on a brief feeling of seriousness. “I’ve never done this before, just letting someone fly my plane" he said. "It feels like I’m sharing a girlfriend with a stranger. Are you sure you’re up to it." Being the first person let loose with another man’s plane is a great honor, but being set free with another man’s girlfriend is something else altogether. Therefore, I assured him I was up to it “and oh yeah, she’ll be needing some rest when I get back.” He closed the door and I cranked the engine. Leaving the ground in any old Curtiss is an incredible thing, but leaving the ground that day in that Robin is something I’ll never forget. There, in one machine, existed a true vintage design from the early days of aviation, a panel layout that only five years later would have been unthinkable, an enclosed cabin that would be the future of aviation, and a powerplant that unfortunately would not. In that plane was engineering from the twenties before flying was truly figured out, some clues to the future when it would be, and a pilot born one year before man stepped on the moon. That is my kind of flying. Working the old girl about the sky, I quickly found the ailerons to be more of an afterthought to control than guidance control. Don’t get me wrong, the plane flies great. It’s just that in a Robin, the ailerons are used more to correct a trend in direction than to start one. As for stalls in the Robin, they come and go casually enough for noon tea, and for the most part she flies like a Cub with a thousand pound bomb strapped to her belly. Landings are likewise just as much fun. Slipping base to final in any nearly any plane will tell you how easy the landing is going to be. Coming ‘round the corner in this old girl feels like driving a car you’ve had for twenty years. You know exactly where it’s going to go, and how it’s going to do it. It just won’t do either as well as a new car. The steering isn’t as tight, the controls are heavier, and a few things may rattle, but the outcome is still just as predictable. Flaring for the three point, one only need remember how high the pilot’s seat is off the ground and set up accordingly to be successful. This requires adding a few inches to where you think that’ll be because it’s always just a hair higher than you remember. Touching down, the large diameter wheels assemblies tug on the plane as they attempt to spool up, the oleos and tailwheel absorb any additional evidence of turf, an odd sound grows louder, and very quickly she is done rolling. That’s when you realize the loud noise in the cockpit is that of yourself howling out loud with the laughter of pure unadulterated aviation fun. What a hoot she is to fly, is all I can say. If you ever get the chance fly one, make sure cash that coupon. Needless to say, at this point it was already a perfect day. Then, as if that just wasn't good enough for Richard, he turned to me and said something along the line of, "it’s a shame you don’t have more time because we’d get the Bestmann (Bücker Bestmann) and give it a whirl if you did." Ring….ring……ring…hey sweetheart, you’re ok with leaving later, right? And like that I had seen Richard’s home, his man cave hangar, and was flying over the skies of Georgia in what is considered the only flying Bücker Bestmann in the states; airworthy doesn’t count. How could I accurately describe the Bestmann? Well, let me spit out a highly overused statement, “It’s a good thing Hitler was in charge of the German military because if not for his many poor tactical decisions, we would be speaking German.” This aircraft design, originally a primary trainer for German pilots during WWII, easily earns a title above that of airplane. Much in the way a BMW is not a car but “The ultimate driving machine,” the Bestmann is not a plane but a flying machine. I was so impressed with the Bestmann and so taken by all its details, that for my first flight, I forgot to follow my “rules for flying anything” mental flash cards and made a mess of the first take off. But there was hope. Applying a little self punishment and Richard's advice allowed me to recoup my composure and make a couple of nice landings and take offs. What? Oh yes, how is it in the air; well it’s great. 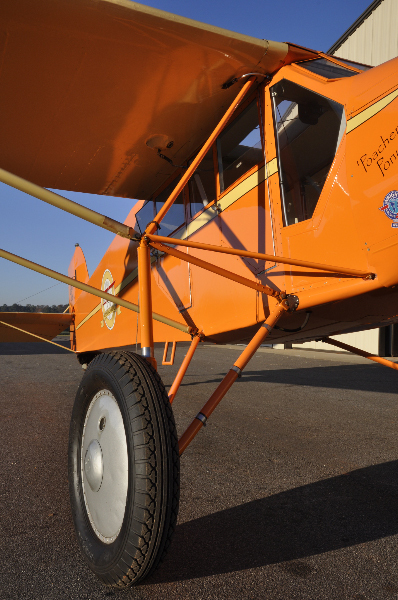 In the air, the Bestmann follows true to its Bücker lineage. If you’ve ever flown a Pitts, think of it as a stable Pitts only better. Now I know some of you Pitts guys will stir me up for this and some of you Bücker guys will stir me up for the same, but let me explain. 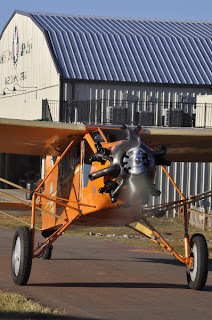 Now again, I realize some of you Pitts guys will still want to stir me up over the idea of traveling in a Pitts and the Bücker guys will want to stir me up for comparing a Bücker to a Pitts, but however you feel about either plane, the one big difference between the two comes down to the practicality of ownership. In such a runoff, in my opinion, the Bücker would always win, despite its rarity. And this is coming from a guy who thinks highly of the Pitts design. Thanks again to Richard Epton for introducing me to Bestmann and Robin. Without guys like you, there would not be enough “fixes” to feed my vintage aircraft addiction. And to my wife Ginger, thanks for your willingness to read a book while I flew about the blue skies of Georgia. Oh, and I can’t forget all the veterans that keep our country safe. While you were out fighting our wars, I was having fun and that is not lost on me. You guys and gals are great and I think about you often and pray in my own way that you are safe. Keep up the good work. You have my support. NOTE: AIRCRAFT FOR SALE. 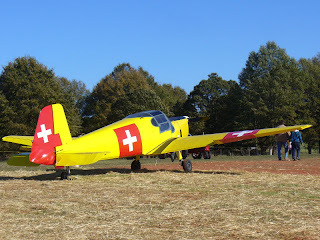 Both of the airplanes I flew that day in Georgia, the Bücker Bestmann and Curtiss Robin, are for sale. Richard has bought himself another fine aircraft and he needs to make room for it. If you are seriously interested in either of these fine specimens, feel free to contact him at 770-460-8730. I can personally attest to how well they fly and how great they both are.